In London, a recently wed American woman's sanity comes into question when she claims to be the victim of a threatening stalker. Boy, is this damsel in distress!! 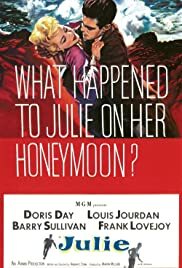 Doris Day had a few "damsel in distress" roles in her movies, but none requiring her to be quite as stressed out as "Julie". Trouble is the film is a bit too overwrought for comfort with Miss Day being pursued throughout by a maniacal husband (Louis Jourdan) whose only problem is he loves her to death--literally!! And not a single supporting character to give us a few laughs. The last half-hour aboard an airliner where her husband has managed to become one of the passengers, is the best part of this neat little suspenser. Although all the usual cliches are present in the script, the terrified Doris manages to look convincingly cool and confident as she handles the controls of the airliner for the story's somewhat pat climax. Louis Jourdan makes the husband look like a really jealous and possessive heel, aside from being a maniac--and since Doris Day reveals in her autobiography that she married a couple of these early on in her career--perhaps that helped her give a very credible performance. Not that she was any slouch in the acting department on a few of her other "damsel in distress" roles--STORM WARNING, THE MAN WHO KNEW TOO MUCH and LOVE ME OR LEAVE ME. Let's forget the phony, overly fabricated MIDNIGHT LACE. Here she gives a strong and sincere performance as a terrified woman. Barry Sullivan gives excellent support as a friend who tries to help her when the police admit they can't do anything. Frank Lovejoy is also fine as a detective. I can't say much for the title tune, "Julie", heard only during the credits and then quickly forgotten by me. To my surprise, it was nominated for a Best Song Oscar--so what do I know?? If you're a Doris Day fan, you'll find this suspenseful even though it takes itself much too seriously. There's not a hint of humor throughout the entire proceedings, not a single moment of relief. It's all very, very intense, whereas some humor would have helped. Of course, there are always those who will laugh at the plot itself. It is, after all, a bit unbelievable by the time stewardess Day takes over the controls. It's to her credit that she makes it look real.